If you look at this website http://www.1914-1918.net/specialcoyre.htm it states that . . . . . . . When the RE Special (gas) companies were formed in July 1915, a decision was taken to issue the corporals (the lowest rank at that time) with revolvers instead of rifles. According to Donald Richter in Chemical Soldiers, there were two reasons for this. First, the revolvers reinforced their auuthority as corporals when they had to give orders to the infantry and they would not need rifles as they would not be advancing beyond the front line, and second, rifles would be a big handicap when they were manhandling heavy gas cylinders and other equipment into position up the communications trenches and in the specially dug launching emplacements. I've 3 photos of that area (I've only posted one on this forum) dated 16th May, 17th May & 21st May 1918. On posting 146 on this forum, it does look as if my Grandfather is holding a rifle. Hence the snippets I am have been gathering from the M Spec Coy War Diary (looked at some years ago), and now this thread and Jeremy Mitchell's book (which I now have, thanks, Jeremy - it's very good indeed), are all very helpful ! Hi, thanks again for that. I have not looked at War Diary for 188 Coy, maybe worth doing so next time I am at Kew ! I used the photo in post 144 in an article that I wrote in about 1988 that appeared in Military Illustrated. There is a copy of this photo in the RE Museum which identifies it as 21st Section, 188 Company. I don’t know if I ever identified the officer. Amongst my Grandfather's things is this Epaulette, How or why he should have had it, I really don't know. Could it be from a German uniform ? My Grandfather's Special Brigade dog tags. This is the sort of thing that many soldiers would pick up as a kind of souvenir I guess. An early sort of pocket knife, used to cut 'bully beef'. Hard to believe that the knife can fit into this . . . . . . .
My Grandfather's medals arrived like this . . . . . . .
. . . . . . . In boxes like these. He never wore his medals and they have been out of their boxes on only a handful of occasions; I don't suppose that there are many medals that still have the original wrapping. Last week, I knew only that my Grandfather was in the Special Brigade. 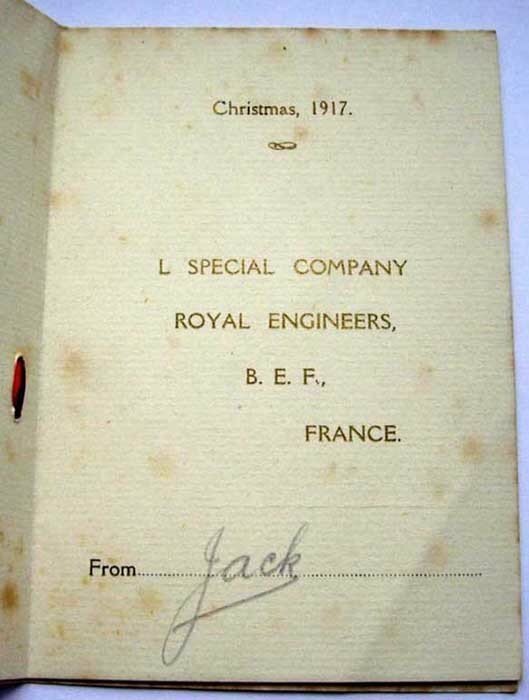 I now know that his number was 106528; he started with 188 Company and later was in L Company, thanks to the Christmas card, I know that he was also in No. 3 Special Battalion. Anyone know anything about them ? I'd be interested to know Terry, if you think that the group photos that I posted earlier could be of No. 3 Special Battalion ??? 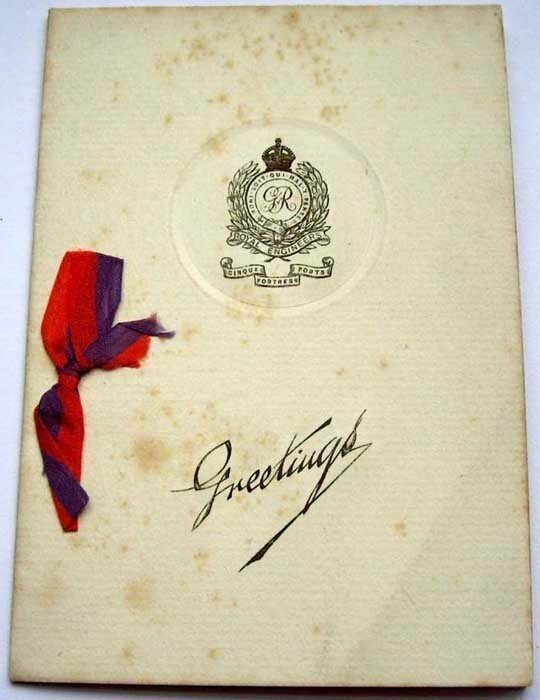 And here is a Christmas card for 1917 . . . . . . .
Glad to see you've made a lot of progress! I'd looked up your grandfather's quote - but then noticed you'd already found it! That's a fantastic collection by the way. If I remember correctly the 'lettered' Special companies were consecutively grouped into Special Battalions (1 to 4; No. 5 Special Battalion comprised the 'numbered' companies operating mortars). I think L Special Company came under No. 3 Special Battalion (that's off the top of my head though - hopefully Terry can confirm). Note: Your group photos of the men standing on the steps of what looks like some municipal building or chateaux seem to be taken during 1918 or shortly thereafter, as many of the men appear to be wearing what look to me like overseas service chevrons on their cuffs (4 blue-coloured chevrons, for example, denoting 4 years of overseas service for men having gone to France in 1915). If this is the case, unless your grandfather transferred again, these photos are likely to be of men from L Special Company, No. 3 Special Battalion. It's from German Infantry Regiment No. 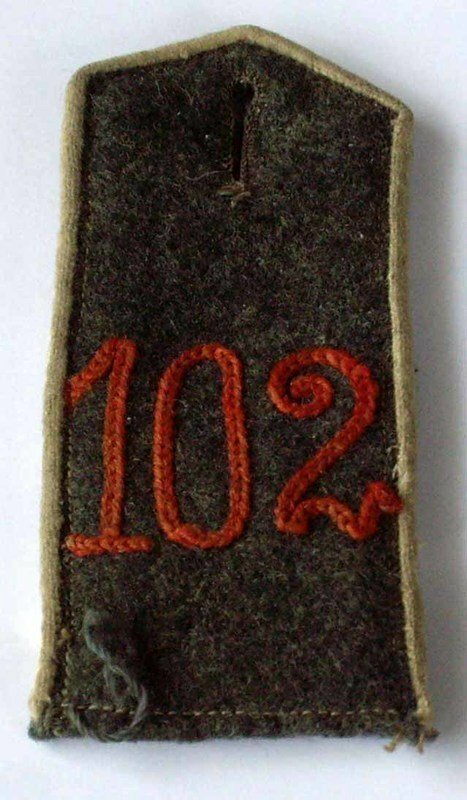 102, a pre-1915 strap. 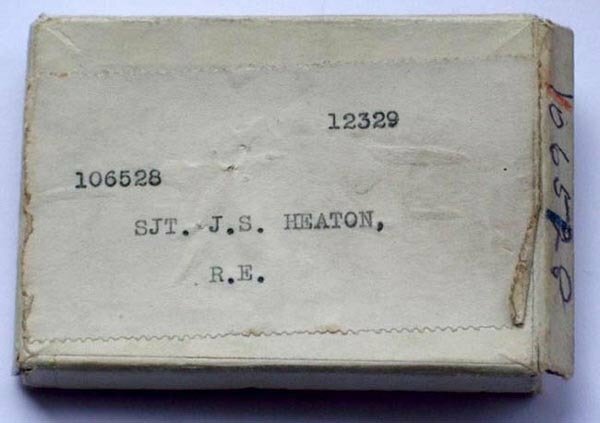 I wonder if it's from a prisoner or a casualty? How on earth do you know such details as that ? I'm sure that you'll be right. Thing is, my Grandfather joined up in August 1915, so I wonder how he came by it ??? Thank you for taking the trouble to reply ! Andy, the white infantry piping was abolished as a wartime austerity measure in January of 1915. The new straps were known as simplified (vereinfachte). However, shoulder straps manufactured before then were worn throughout the war. On September 21, 1915, All-Highest Cabinet Order (Allerhöchste Kabinetts-Ordre or AKO) No. 735 introduced much simpler uniforms, including the M1915 Blouse (Bluse). Many uniform details were simplified in order to ease and speed manufacturing, save material, and make it harder for the enemy to identify the unit of a captured or dead soldier. However, the M1915 uniform was never universally adopted, and soldiers continued to wear the elaborate M1910 uniform with all its fancy decorations as well as the simplified uniform ordered in March of 1915. In this photo of flamethrower pioneers taken in late 1917, the man standing on the left has the textbook M1915 uniform, the NCO has the simplified uniform of March 1915, the next two have the M1915, and the man on the right the M1910 with the old, long Guard lace (Litzen) on his collar. 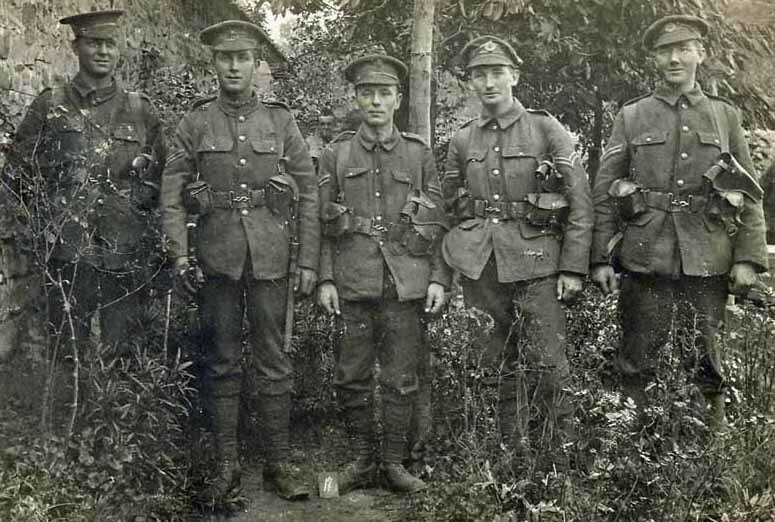 The man sitting on the left in front has the M1915 uniform with March 1915 Guard lace on the collar, while the man sitting second from left has the M1910 uniform with the Guard lace of September 1915 on his collar. Both of these combinations are entirely wrong and against regulations, but there you go. The final two men sitting second from right and right wear the M1910 uniform with black M1915 shoulder straps and March 1915 Guard lace. As a final example of weirdness, the NCO with the walking stick has the death's head sleeve badge but lacks Guard lace on his collar, something I've never seen before. Germans have the reputation of being by-the-book sticklers, but photos show otherwise. I can confirm this from the experience of my father, George Oswald Mitchell (G.O.M.). 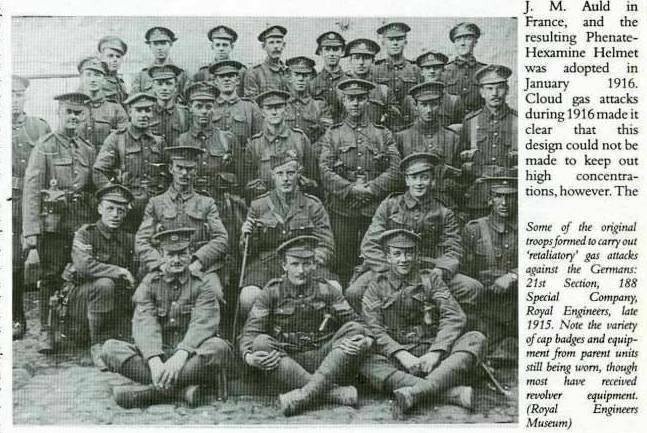 He was transferred from the 1/6th Battalion West Yorkshires, joining No 2 Section of 186 Special Company RE on Friday, 16 July, 1915. On 3 September, he was transferred to No 28 Section of 188 Special Company RE on the first formation of the special companies. 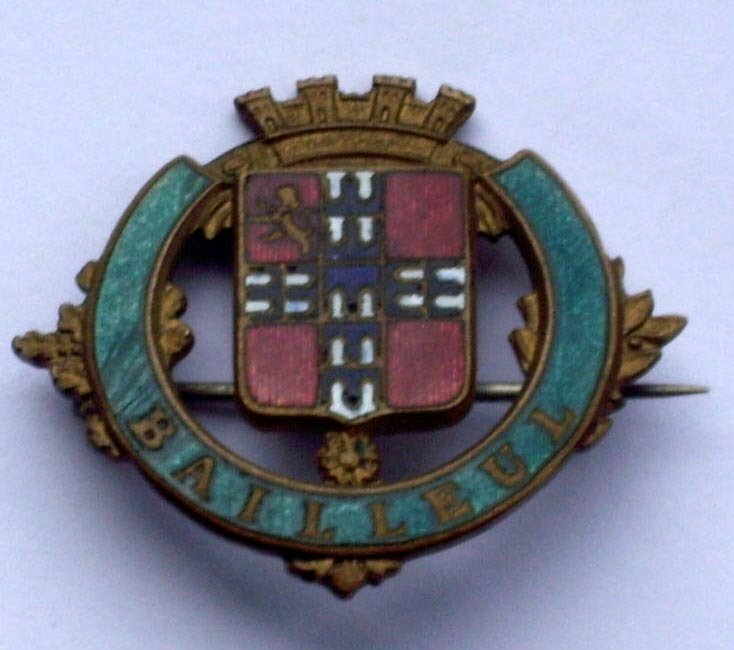 When the Special Brigade was constituted early in 1916, each of the existing special companies (186-189) became the nucleus of a battalion. 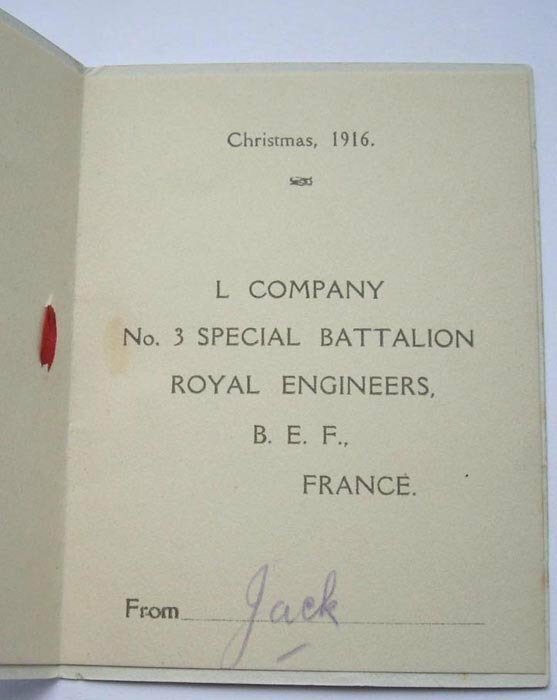 The numbered battalions (1-4) each had four lettered companies. For example, G.O.M. 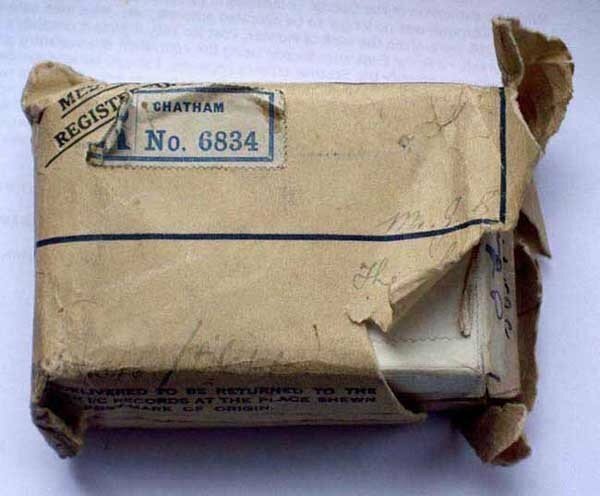 's 'M' Company was in the 3rd Battalion. Just to confuse matters further, in February 1916 a new, 5th Battalion was formed, with numbered companies (1-4). You probably know all this already, but I thought I would set out the sequence of events. Marvellous photographs - thank you. It's the first time I have ever seen a picture of the Neapolitan ice cream coloured arm brassards. 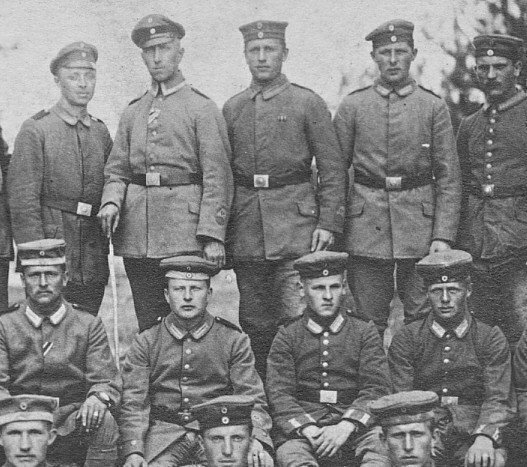 The group photographs are much more likely to be of a company, not a battalion. In any event, the battalion structure in the RE Special Brigade soon faded and the company was the important operational unit. Incidentally, I still think that the most likely candidate for the house is Foulkes HQ at Helfault, though unless someone else comes up with some evidence, we may never know. Did you see my post No. 124 re Pioneer George Dawson. to receiving it very shortly. I believe George took part in the Trench raid 27/28 June 1916 with the 1/19 London Regt. He died during 28/6 and is buried at Bully-Grenay cemetery. I am waiting to hear from Charles Fair as i understand he has a very detailed account of the raid. Thank you for ordering a copy of Shrapnel and Whizzbangs. I hope you enjoy it - though I am not sure 'enjoy' is quite the right word. I have been away, so I missed your post 124. I don't think I have any specific information, but here goes - apologies if you know all this stuff already. 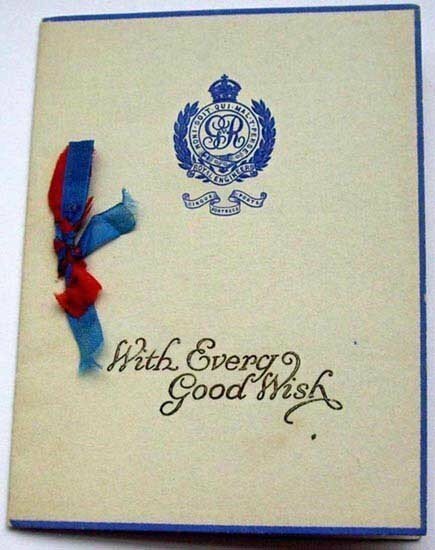 George Dawson joined the Special Brigade at a time of major reorganisation and expansion. Foulkes had decided to change the policy of the lowest rank being corporal and most newcomers at this time (early 1916) were ranked pioneer. You say he joined 'No 4 Special Brigade'. However, owing to the confused labelling of Special Brigade units, this is ambiguous. It could have been No.4 Battalion, which consisted of N,O,P and Q Companies, or it could have been No.4 Company, which was part of the new 5th Mortar Battalion. From the timing and nature of George Dawson's injuries, I wonder whether he was involved in all this. Incidentally, I don't think that he Special Brigade was ever in action at Verdun. In the Spring of 1918, many of the Special Brigade units fought as infantry in resisting the great German offensive. Thankyou for your response to my query, i am most grateful for your information. I am looking forward to reading your book and i have also requested a copy of " Chemical Soldiers " from my local library.